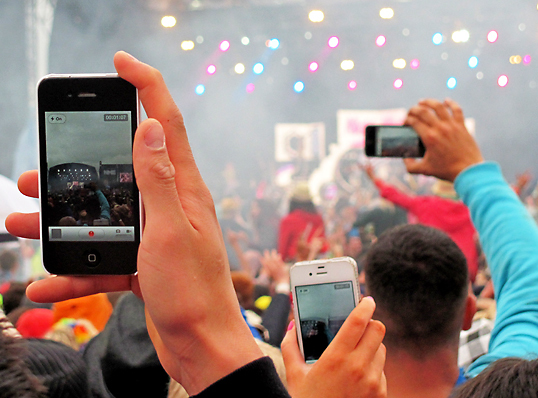 Music fans using mobile phones to record a performance on the radio 1/NME stage at T in the Park 2012. The stage is actually visible on the screen of the leftmost mobile, which must have a fairly wide angle lens since it has also captured the blue sleeve and camera visible on the right of this image. Photographic conditions at the festival were diabolical - my "wet weather camera" is on the critical list due to rain, low flying beer and worse. This page has been viewed about 379 times. OK, my interest in what constitutes a proper Geograph is well and truly aroused. I had one for NH1156 classed as a supplemental as it was taken 150m outside the square (and on the ground mind) - various comments such as why didn't I walk the 150m, its best to be in the square, if we accepted this then you could stand on a ridge with a telephoto lens etc etc where raised, yet this photo is taken a good 1km away and at least 1km in height above too. I can't possibly see how this could be accepted as a first Geograph, its a good supplemental granted. Anyway no problem - I am flying to Lanzarote next month so am marking up all the Geographs between Glasgow and the south coast that the flight is likely to fly over.